Not the South, but the Confederacy Rises Again! Liberals foolishly believe that good ol’ redneck racists joined the party of Lincoln. 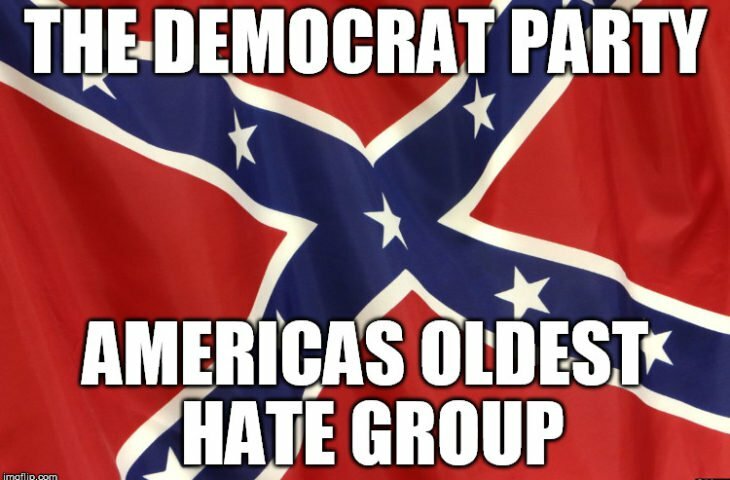 Just because northern Republicans moved south in the 80s to escape socialist unions making southern states majority Republican doesn’t mean racist rednecks changed allegiance from Democrats. After the Civil War when Republicans took Democrat’s slaves away they promised that “The South will rise again!” Democrats no longer control the South but control the North and the Left Coast. They can only maintain that control so long as they have socialist slaves dependent on them. So, they import foreign cheap labor to join their black welfare voter slaves to overrule patriotic American citizens who are not fooled by their lies about socialism. Democrats are still the Confederacy that wants to abolish the Constitution. They’re just not in the South anymore. Leftists are trying to shush Maxine Waters telling people to harangue and terrorize Republicans and ICE agents and their families. They don’t want their members of Congress openly stating their fascist ideology before an election. They want people to listen to the lie of Michelle Obama, “They go low, we go high,” while her husband sends out his army of Brown Shirts to employ his violent tactics because “if they bring a knife, we bring a gun” is the Chicago way. Democrats have already been shooting Republicans, police, and any patriotic Americans they have a chance to kill. They did it at the congressional baseball game last year. They did it at the concert in Vegas. They do it every time they attack a school to kill kids. And they do it every time they murder a police officer. When restaurant owners are kicking Republicans out of their establishment after leftists destroyed businesses, such as those that refused to go to gay weddings as photographers or bake gay themed cakes because they were Christians, they establish themselves as two-faced, self-righteous hypocrites! These are the kind of people that would spit in your food when you’re not looking. They do this because they are not only petty, but because they are impotent. Like their fairy tale of Trump hiring Russian prostitutes to pee on Obama’s bed is obviously turned about. There is nothing impotent about Trump whose vengeance on Obama is taking the presidency to undo his leftist legacy, while it is Obama who is unable to save his anti-American legacy who would commit the impotent act of having hookers pee on Trump’s bed. All of this illustrates the hatred Democrats have always had for America and patriotic Americans. They make movies and tv shows depicting soldiers are criminals and baby killers and slander patriots through both word and deed. They praise criminals making their lingo like gangster and pimp to mean something good. The Left believes laws were made to be broken and they are breaking immigration law in such an extreme that they claim it must be remade from the bottom up. They call for abolishing ICE, which is abolishing border protection from invading criminals. This is the psychosis of liberals to believe they can make America a better place by allowing any criminal into the country and keeping police from doing their jobs of stopping them – especially before they even get into the country. This entry was posted in Politics and tagged Democrat agenda, Democrats, Donald Trump, Illegal Immigrant Invasion, Liberal Fascism. Bookmark the permalink. 1 Response to Not the South, but the Confederacy Rises Again! The Democrats are the real racists, derp!